IntelliRamp® is an electronic control system allowing for program-controlled, accurate brake processes. Being combined with IntelliRamp®, our brakes are therefore suitable for the use in sophisticated applications. The control computer is the core system component, responsible for all calculation and control functions necessary to control the brake systems. As for the hydraulic brake systems, the IntelliRamp controls and monitors the function of the power pack; the system is designed to control parameters such as oil level, oil temperature and hydraulic pressure. As no further relays are required, this ensures a higher degree of availability and reliability of the IntelliRamp. Optionally, other standard bus systems like e. g. Profibus and EtherCAT are available. The ramp-supported braking processes are activated by a signal, safe from cable break, and performed via a closed control circuit utilising speed against time. The ramp is defined by a rated speed and a braking time taking this speed into account. IntelliRamp allows the use of three brake ramps which can each be programmed individually and which can also be started irrespective of each other: continuous deceleration, continuous time operation and continuous speed control. 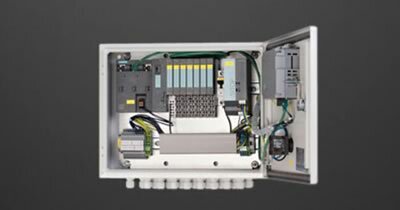 The entire system features an uninterruptible power supply in order to ensure a full braking cycle is achieved even in cases of a power outage. Or in case of critical machine conditions, IntelliRamp maintains full control of the brake system avoiding damages to the machine. The control system is operated via touch screen with menu navigation. Other relays are not necessary which increases the availability and reliability of IntelliRamp® significantly.